Turquoise wedding ring handcrafted in sterling silver by Hileman Silver Jewelry. This sleek turquoise wedding band measures 10mm wide at the top with a slight taper toward the bottom. The ring is inlaid with 7 pieces of plain blue turquoise separated by thin silver dividers. 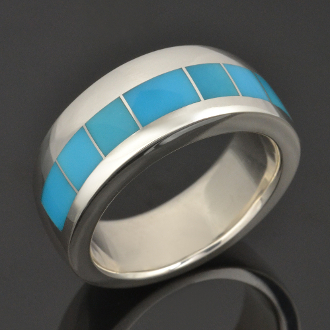 The turquoise inlay channel is slightly offset from the center giving the ring a unique and more contemporary look. This handsome turquoise wedding ring will be made to order in your ring size in 3 to 6 weeks. I will need your exact ring size for your order so please do not guess! If turquoise is not for you, I can inlay this same ring style with other stones such as dinosaur bone, black onyx, lab opal or any of the stones you see on my site. Message me with your customization ideas and I will give you a price quote. I can also make a matching woman's or man's band if you would like to make a matching turquoise wedding ring set. If you would like to upgrade click the box and type "Upgrade my ring to Continuum Silver".